Handballs and half-heartedly played matches have defined Brazil at the World Cup thus far. And if you’ll allow me to be blunt for a moment, I’ll say what many of us are secretly thinking but are hesitant to admit: Brazil do not deserve to win the World Cup. Aside from the brief glimmers of magic we saw from Maicon and Elano, the Brazilians have been a complete snooze. To say that their performance has been uncharacteristic would be putting it lightly. 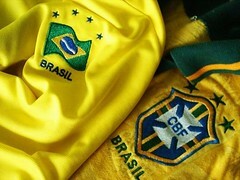 Teams as good as Brazil, who win tournaments as often as Brazil, tend to inspire feelings of disdain and jealousy. Brazil inspires the opposite. They play so beautifully, with such poetic abandon, that cheering them on is practically automatic. You’ve got no other choice. If you’re a fan of good football, you love Brazil. Watch Ronaldinho do a few step-overs, leaving several defenders dizzy on his way to scoring the prettiest goal you’ve seen in years and then try to tell me that you didn’t find something – everything! – heart-stopping about it. Everyone’s favourite buck-toothed Brazilian, however, is not among the twenty-three men Brazil manager Dunga has elected to bring with him to these World Cup finals. And for all their history, it is shocking that one can find themselves watching Brazil play and be itching to switch off amidst alternating emotions of boredom and disgust like I did during their clash with Portugal. Juan’s cheeky handball maneuver was just about when I reached the end of the line. Let’s, for a moment, contemplate what Brazil winning the world cup would say about the state of the game. On the surface, Brazil would simply win another cup… so what? It would hardly be a startling statistic to add to the history books. This would be their sixth World Cup should their campaign be successful. However, even casual football observers can sense that there is something dangeously off. The approach the Brazilians have taken this summer has been vastly different from that of previous tournaments. They’ve swung like a pendulum from one end of the football spectrum to the other under Dunga: from joga bonito to joga playing-not-to-lose. To be fair, the results have very much gone Brazil’s way. I’ll be the first to concede that an ugly win is still a win. But I do think that much of what has been attributed to Dunga’s defensive tactics is due more in part to the quality of the squad (it’s still Brazil, after all) and the relationships he builds with players (ie. trusting Elano and Gilberto despite declines in form and popularity – he sticks with players, building their confidence). Results aside, my cardinal concern isn’t about Brazil on its own but rather with the spread and influence of Dunga’s philosophy. No longer a side that is distinctly aware that football is, at the end of the day entertainment, Brazil have lost what was most admirable about them. They’ve been playing to get by in this tournament rather than to entertain. Their performances have been hesitant and measured, if not somewhat entitled in nature — as if to say ‘we’re supposed to win, not play’. The philosophy appears to have spread to other sides already. Going beyond elementary time-wasting, we saw Spain give us a solid 20-plus minutes of completely pathetic backyard passing drills in an attempt to keep the score. They were content to win meagerly rather than play the ball. Inevitably then, the obvious question that looms overhead is whether this ‘new’ Brazil is simply a passing nuisance or if its introduction to the footballing world predicates a permanent change to what we like to call the beautiful game. Brazil lifting the World Cup under the guidance of Dunga would send a resounding and pretty unsavory message to those looking to win the World Cup: Don’t play.